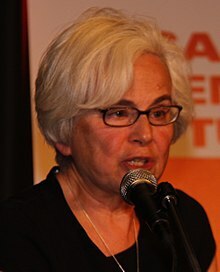 Ellen Meiksins Wood (April 12, 1942 – January 13, 2016) was an American-Canadian Marxist historian and scholar. She was a publisher of the Monthly Review from 1997 to 2000, along with Harry Magdoff and Paul Sweezy. She wrote over ten books. Her books The Retreat from Class and The Origin of Capitalism won awards. She was a leading Marxist theorist. Wood was born in New York City. Her parents were Latvian Jews. She was married to Neal Wood until his death in 2003. They had two children. She was later married to politician Ed Broadbent. Wood died from cancer on January 13, 2016 in Ottawa, Ontario. She was 73. Wikimedia Commons has media related to Ellen Meiksins Wood. ↑ "Ellen Meiksins Wood, author and wife of Ed Broadbent, dead at 73". Winnipeg Free Press. January 14, 2016. Retrieved January 15, 2016. This page was last changed on 15 January 2016, at 11:54.